First International MAKE Maker Meetup, on 3D Printing, Nov 15 #3dthursday « Adafruit Industries – Makers, hackers, artists, designers and engineers! Next Thursday, the first of our new International Maker Meetups is happening. The idea here is to get makers all over the world together, to talk about the latest issue of MAKE, and making in general, hang out with like-minded people in your area, and hopefully have a lot of fun. The main subject of this meetup will be 3D printing and our just-printed Make: Ultimate Guide to 3D Printing. We will be hosting a face-to-face meetup here in Sebastopol and other people are creating their own meetups around the world. We will also be doing a Google HOA at 6pm PST/9pm EST on the 15th that you can tune into and and perhaps become a part of. Participants at the meetups will get a free PDF copy of the Ultimate Guide to 3D Printing. 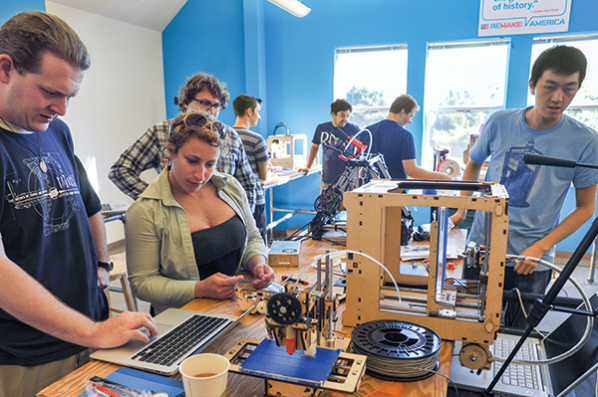 If you want to set up a meet up in your area or want to join one, visit the MakerMeetup page. We hope you’ll participate. Whether you’re a designer, inventor, hacker, tinkerer, or weekend DIYer–anyone interested in finding out more about 3D printing and design is welcome! We suggest getting together at convenient locations such as a hackerspace, coffee shop, community center, library, or restaurant. Bring your laptops, tablets, smartphones to access the Internet and G+ Hangout On Air. The first 25 organizers will receive a MAKE meetup welcome kit that includes: 12 copies of the MAKE Ultimate Guide to 3D Printing, MAKE T-shirts, notebooks, stickers, and buttons. The top 3 organizers with the highest number of RSVPs will get a $200 stipend for beverages and food!